I made these delicious Cookie Dough Brownies when I went to visit my buddy back at the end of 2013. He knows how much I enjoy being in the kitchen so I thought it would be a nice surprise to bring a treat for him and his daughter when I went for a visit. Like myself he loves brownies and cherry cheesecake although I never did get around to baking him one of those like I said I would. Maybe one day. I’ve been meaning to post this recipe for a while now but I had forgotten about it until I found it in my archives which I was scrolling through the other day looking at photos. What I did was I took my chocolate chip cookie and fudgy brownie recipe and created this cookie dough brownie recipe. I’m forever making homemade cookies and testing out new homemade brownie recipes so I figured I could combine the two to make this bar recipe. Why enjoy a regular brownie when you can jazz it up? Don’t get me wrong, I stand by the Classic Fudge Brownie. You only have to look at my Pinterest page to see how much I love brownies. There’s well over 2000 Brownie Pins and plenty of brownie loving followers. For this recipe I wanted to make sure that the brownie was dense and fudgy because you don’t want to make this a cake brownie as you might struggle with the cookie dough topping. I used my own brownie mix recipe Mr.CBB’S Fudgy Brownies and eliminated the baking powder to achieve the dense texture. Even though I find my brownies are dense you will appreciate leaving it out. You will also notice that I add lots of chocolate chips to my brownies and that’s what makes them so special. But don’t tell anyone I told you that, it’s my brownie baking secret. Shh! Once the brownies are baked let them cool down to room temperature then make your cookie dough topping. I know you might think eating a brownie with cookie dough on top sounds odd and very sweet but don’t worry I promise you will love them. I can agree though that these cookie dough brownies are very sweet but you wouldn’t be reading this if you didn’t like sweet treats. Besides the photo kind of says it all. Some of you might be wondering about the cookie dough and eating raw eggs but don’t because I’ve removed them from the recipe and it still tastes amazing. You will have no worry about salmonella poisoning. Since we are not baking the cookie dough you don’t need the eggs or the baking powder or baking soda I would typically use in a chocolate chip cookie. You will notice there is a fair amount of butter, sugar and milk to tie it all together but it will make sense once it’s all done. Once the cookie dough was done I spread it over the cooled brownie then refrigerated it for a couple of days before heading to my best friends house. I put them in the freezer after 12 hours so they travelled frozen that way I didn’t have to worry about them melting on the way to his house. When I made this particular batch I used to tinfoil pans from the Dollar Store. 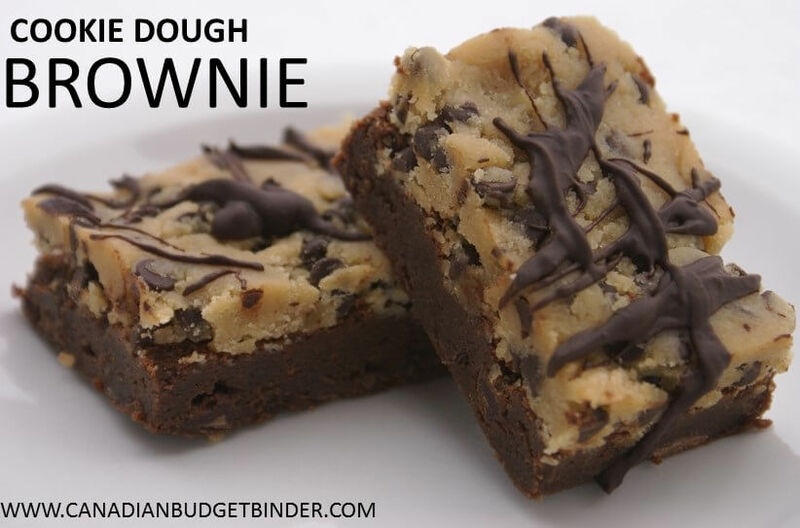 They seem to be half a pan of a 9×13 tray of brownies however you can make this cookie dough brownie mix as thick or thin as you want it depending on the pan size you use. These brownies are best eaten after 12-24 hours which will give them time to set and the flavours to shine through. When you cut them use a sharp knife and cut them cold that way they don’t mush on you like they might if you wait until they come to room temperature. On the top I simply drizzled more chocolate but I waited until I cut them and then I drizzled. That way it made it easier to cut the brownies. You can also add coconut on top or some people like to add mini chocolate chips too then drizzle with more chocolate. I hope you enjoy these cookie dough brownies as much as we both did, in fact I think he enjoyed them more than me because the tray was gone with-in a day. Prep Time: 15 mins brownie mix 10 mins Cookie Dough plus refrigeration time 12 -24 hours. If you love cookies and brownies you won't want to miss out on this match made in heaven where I've paired the two together to make the perfect brownie aside from the classic. Enjoy. 1 cup of chocolate chips to melt and drizzle on top if you want but it looks pretty! Line a 9x13 baking pan with parchment paper or tin foil so you can easily remove the entire pan of brownies once they are cooled and you are ready to cut the finished product. Bake at 350 for 20-25 mins test with toothpick to make sure it comes out clean but don't over-bake. In a mixing bowl add the butter and sugars then mix together with a hand mixer or stand mixer. Once your brownie base is cooled completely evenly spread a layer of the cookie dough on top. Cover with tin foil or wrap and refrigerate for 12-24 hours or freeze until you need it. Once you need it take it out and cut it while it is cold so you get nice even brownie bars. If you wish to drizzle more chocolate or other goodies on top I chose to do it once I cut the bars. I hope you enjoy these chocolate chip cookie dough brownies as much as we did and don’t forget to share the recipe with your friends or Pin it on Pinterest! You can also print the recipe above by clicking on the print option. Is your savings account an indicator of your wealth? I always receive this Chocolate Chip Cookie Dough Brownies as a Christmas present as they know this is my favorite. I have been wanting to bake this and I am gonna use your recipe, Mr CBB.